According to a new order, the World Boxing Association will recognize Canelo Alvarez as their champion at middleweight and super middleweight. Alvarez (51-1-2, 35 KO's) won the WBA and WBC 160-pound world titles in September 2018, when he defeated Gennady Golovkin by majority decision, and will defend the titles again on May 4th in a unification against Daniel Jacobs, the IBF titlist, on May 4 at T-Mobile Arena in Las Vegas. Canelo also won the 168-pound WBA "regular" title in December, when he easily dismantled Rocky Fielding Jr. in a third-round stoppage. Callum Smith, who holds the WBA's "super" world title, is recognized as the real champion at 168-pounds. Floyd Mayweather Jr. was given the same treatment. Mayweather was also allowed to hold WBA world titles in multiple weight classes for years. Mayweather captured the WBC welterweight title with a fourth-round knockout against Victor Ortiz in 2011 and won the WBA junior middleweight title with a unanimous decision against Miguel Cotto in his subsequent fight. Mayweather was allowed to remain the WBC's champion at 147-pounds and defended his title against Robert Guerrero before moving back up to 154-pounds to challenge Canelo in September 2013, who at the time was the WBC titlist. 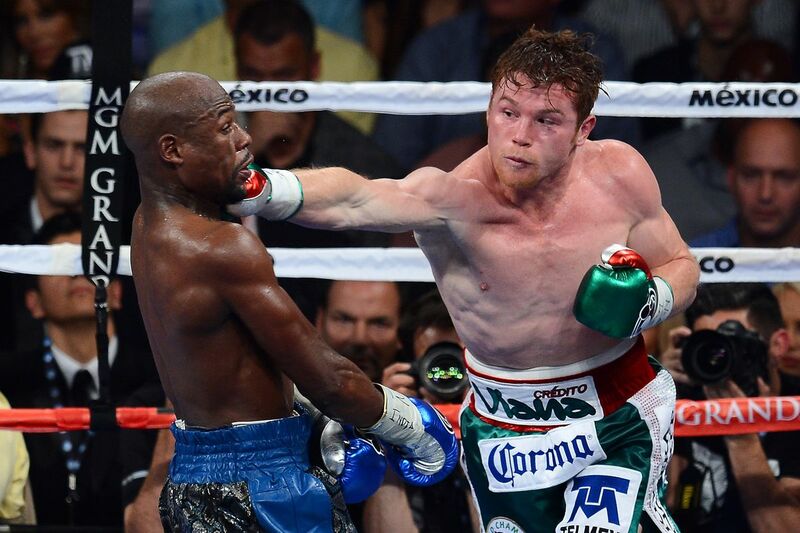 Mayweather ended up dominating Canelo in a one-sided fight, despite one judge awarding Alvarez with six rounds to make it a majority decision. Both sanctioning bodies allowed Mayweather to hold their junior middleweight titles until his retirement in 2015, despite him not fighting at the weight class for two years.